Subhash Pandey, director, UIC Center for Research in Alcohol Epigenetics. Photo: Joshua Clark. Click on image to download. The researchers looked at postmortem human amygdala tissue obtained from the New South Wales Brain Tissue Resource Center in Sydney, Australia. The amygdala is the part of the brain involved in emotional regulation. The specimens were from the brains of 11 individuals who started drinking heavily before the age of 21 or early-onset drinkers; 11 individuals who started drinking seriously after the age of 21, known as late-onset drinkers; and 22 individuals with no history of alcohol use disorder. The average age of death of the individuals from whom the samples were taken was 58 years old for those without alcohol use disorder; 55 years old for early-onset drinkers; and 59 for late-onset drinkers. Amygdalae of individuals who were early-onset drinkers had about 30 percent more of a molecule called BDNF-AS, a large non-coding RNA. Usually, RNA is involved in the production of proteins from DNA, but this one is not. BDNF-AS regulates a gene that produces a protein called BDNF. This protein is a growth factor and is crucial for the normal formation and maintenance of synapses throughout the brain. When there is more BDNF-AS, there is less BDNF. The brain tissue of early-onset drinkers had 30 percent to 40 percent less BDNF compared with brain tissue from people with no history of alcohol use disorder. This reduction in BDNF was not seen in brain samples from late-onset drinkers or from people with no alcohol use disorder. 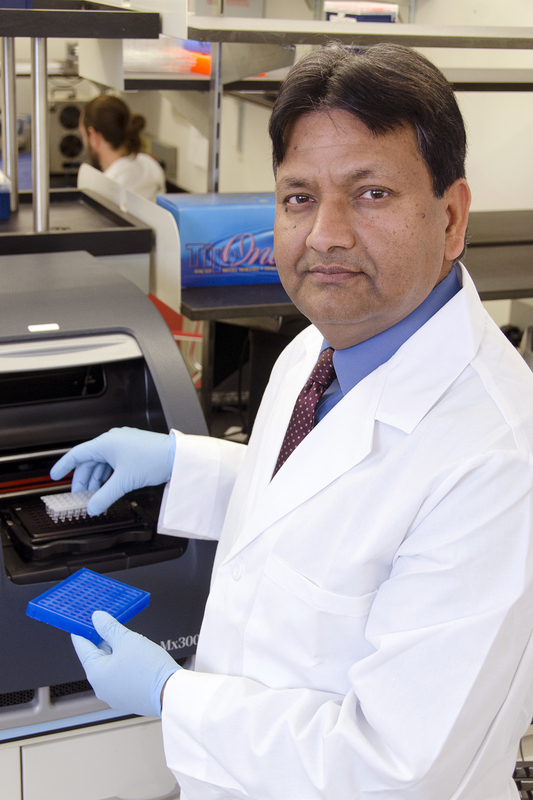 Subhash Pandey, professor of psychiatry and director of the UIC Center for Alcohol Research in Epigenetics, and corresponding author on the paper, believes that epigenetic changes to BDNF-AS are the reason BDNF is lower in the amygdalae from people who started drinking early in life. In the amygdala from people who started drinking after age 21, there were no such changes. Pandey and his colleagues found that the increase in BDNF-AS in the early-onset drinkers is caused by decreased methylation of BDNF-AS. Methylation is a type of epigenetic change where a molecule containing a methyl group is added to another molecule and results in a change in genetic expression. The decreased methylation of BDNF-AS is believed to be caused by early-onset drinking and appears to be a long-lasting change. “The epigenetic changes we saw in the amygdala of early-onset drinkers can alter the normal function of the amygdala, which helps regulate our emotions, and may cause individuals to be more susceptible for things like anxiety, which we have shown in other studies, or the development and maintenance of alcohol use disorder later in life,” Pandey said. John Peyton Bohnsack, Tara Teppen, Evan Kyzar and Svetlana Dzitoyeva from the University of Illinois at Chicago are co-authors on the paper. This work was supported by the National Institute on Alcohol Abuse and Alcoholism grants P50AA022538, UO1AA-019971, U24AA-024605 and RO1AA-010005 and a Department of Veterans Affairs Senior Research Career Scientist award.